Above: Bacilio Santoyo (from left), Juan C. Dávila, Jane Tobias, and Sylvanna Falcón practicing audio recording techniques in Watsonville. 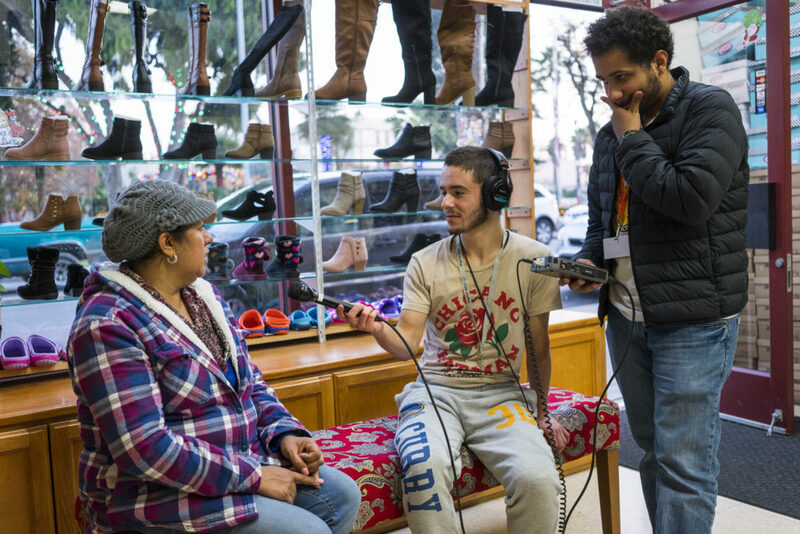 Photo by Nick GonzalesAn alliance of educators is helping young people in Watsonville—a group that historically hasn’t had much influence—amplify their voice by taking to the airwaves. 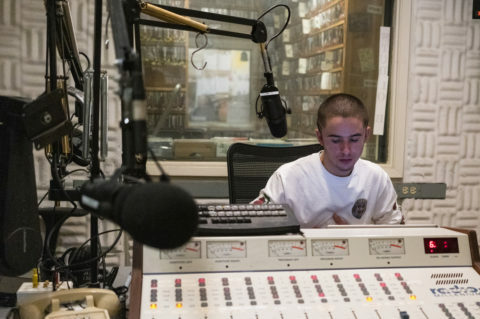 A collaborative broadcast media class came to life from the partnership of a UC Santa Cruz professor, a radio broadcast advisor, a graduate student, and a digital hub for youth. 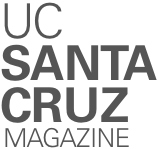 Funded by the Community Foundation of Santa Cruz County and the Chancellor’s Graduate Internship Program of UC Santa Cruz, the idea originated when Sylvanna Falcón, associate professor in Latin American and Latino studies and director of the Research Center for the Americas at UC Santa Cruz, and award-winning journalist Keith Rozendal, KZSC-FM broadcast advisor, realized they could design a community-based news project that was in direct contrast to the general coarsening of the American political landscape. 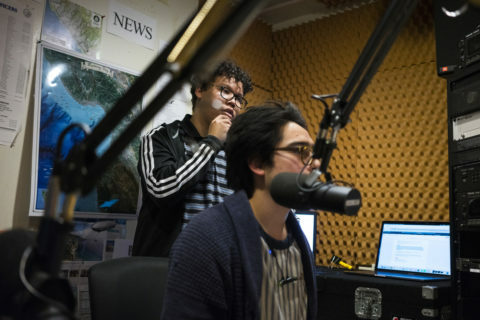 Disheartened by the 2016 election, Falcón said she wanted to put “good, smart conversations out into the universe and see what happened.” In response, she inaugurated her show at UC Santa Cruz’s own KZSC-FM radio. Voces Criticas/Critical Voices (VC/CV) now reaches potential audience of 1.5 million listeners via KZSC’s FM signal in Santa Cruz and Monterey counties. Falcon podcasts every interview via KZSC’s eclectic podcast stream at kzsc.fm/talk. The show, which features interviews with public intellectuals, artists, activists, and other community members about the urgent issues facing communities of color in the current administration, is resonating with the public. The show’s oversized impact, and her desire to work with South County youth, led Falcón and Rozendal to imagine where else KZSC could go. They wondered: What might happen if Watsonville-area students also had a chance at the mic? What stories would they share, and how could their radio presence change their lives, and the lives of their listeners, and possibly even diversify the media landscape? “The whole approach is, we set you up with a recorder, we look at the levels, you learn your way around the equipment, and then you’re in a room, doing this on your own,” Falcón observed. This method follows KZSC’s model of learning-by-doing. As part of their intensive studies, the students began recording news highlights to be played on the air at KZSC. The recording took place with strong guidance from documentary filmmaker, journalist, and UC Santa Cruz Latin American and Latino studies graduate student Juan Carlos Dávila (Ph.D. ’22), who keeps a close watch on their deadlines. Students also made a special appearance at KZSC, where the radio station’s student news director and volunteer reporters helped them record some of the broadcasts. Most of the recording was done at the Digital NEST (NEST stands for Nurturing Entrepreneurial Skills with Technology), a technology learning center in Watsonville designed to help young people from south Santa Cruz County not only master skills like programming, game design, filmmaking, and graphic arts, but also create their own projects and get a taste of the work world by hiring out to local companies. The ambitious founder of Digital NEST just so happens to be another Banana Slug, Jacob Martinez (Oakes ’04, evolutionary biology). One winter afternoon, Watsonville students had the run of KZSC. They ate snacks, sprawled out on a row of sofas, and prepared to immerse themselves in digital recording technology. Keith Rozendal, broadcast advisor to KZSC, fired up the students about the possibilities of radio. Such pep talks help get students over the initial learning curve. Now, Tobias is one of the students who is creating a podcast. Her episode is inspired by the 1996 play Watsonville: Some Place Not Here, which drew heavily from interviews with South County residents. She even hopes to interview the acclaimed playwright and Chicana activist Cherrie Moraga. Another student, Bacilio Santoyo, 19, is planning a podcast about Watsonville-area day care workers who look after the children of farmworkers during their long days in the fields. “I think of journalists as the real heroes,” said Santoyo, who was impressed and a little intimidated when he found out that DáVila had worked for Democracy Now!, a daily, global, independent news hour. Now he’s hoping to add his own voice to the airwaves and bring some attention to an underreported story. The issue strikes very close to home for Santoyo, whose mother is a day-care professional supervising migrant children. Elijah Veal, 22, is preparing a podcast about a live radio play at Cabrillo College based on the work of Alfred Hitchcock. The class is giving him a good introduction to on-the-air storytelling, he said. In some ways, it feels like an extension of his passion for hip-hop. These original podcasts are the students’ big chance to explore topics close to their hearts, “including the unsung heroes of Watsonville,” said Falcón. Many of their stories are simultaneously local and global. The current political landscape, with its heavy focus on immigration, adds relevance and urgency to this programming. In putting forth their work, these students are speaking their truth to listeners, rather than sitting back and letting others tell the stories for them, said Dávila, the graduate student. For Falcón, watching these students discover their power on the air brings her right back to her first moments in the KZSC studio, where she realized that her impact could be much more far-ranging and immediate with radio. Unfortunately, she continued, some American broadcasters abuse that privilege and are toxic on the air.